The Google Pixel 3 and Samsung Galaxy Note9 sit at the very top of that list, as both got 92 points from DxOMark. 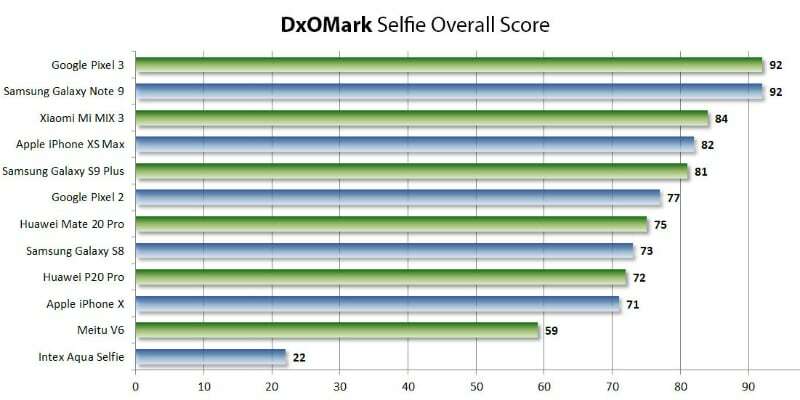 Today DxOMark have announced their new DxOMark Selfie test protocol for smartphone front cameras and have ranked some of the phones already. The test organisation also stated they have devised the entire testing procedure in tune with the way users actually tend to use the front facing cam on their smartphones. DxOMark is the place where your smartphone's selfie cameras can be tested and report can be obtained. DxOMark said in a statement that they chose to introduce a distinct category for the selfie camera because the front and main cameras are used differently. With the introduction of the new Selfie category, DxOMark has also updated the way it presents the smartphone camera rankings. As expected, the top flagship smartphones of 2018 from Apple, Google and Samsung are present on top of the list. As per DxOMark, testing secondary and tertiary camera modules is not part of their protocol. The testing of the selfie cameras is done by clicking some 1500 photos and video recordings that run for 2 hours and this is done for each of the phones taken up for testing. We may see phones in the future with higher scores than 100 on the selfie test. According to the tests, the Google Pixel 3 auto-focus system is the best on the market, while the Galaxy Note 9 offers better exposure and colors. Meanwhile, the Pixel 3 comes with one 12.2-megapixel sensor on its rear and two 8-megapixel lenses on its front. The Pixel 3 was best for photos, while the Note 9 led the pack for video. The Galaxy Note 9, on the other hand, won at video recording, cleaner images, and softer faces. Selfies taken with the Pixel 3 have a cooler white balance and a stronger contrast. The Samsung (Note 9) is a little better at exposing for faces and applies a little less contrast to faces, making for a slightly more natural look.